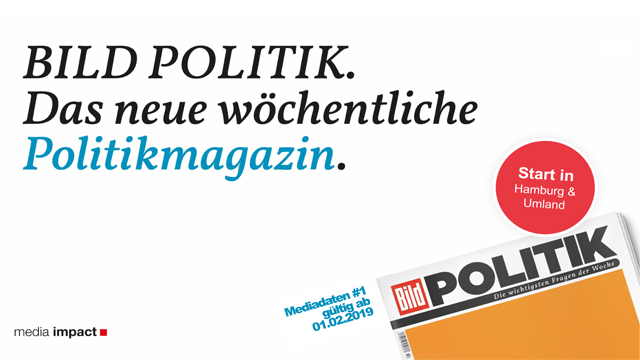 In BILD POLITIK, Germany’s most-quoted political editorial staff offers all those interested in politics clear answers to the most important questions of the week. Always on Fridays. Always short and sweet. Always on point. Today, news is available around the clock. The real-time flood of information often generates more questions than it answers: In the digital age, the reader is of course well-informed, but nevertheless unsettled and often enough even annoyed. Therefore, shrewdness and clarity are honoured; epic scope and complexity have become worn-out. In print media, as well. BILD POLITIK answers this with a completely new magazine structure. Our world cannot (can no longer) be structured according to politics, the economy, inside, outside. But, it can be segmented by emotions, because political events move us like never before. We therefore divide our magazine into the categories of anger, curiosity and joy. or even, “How nice!”. If a political topic triggers such a feeling, there are always open questions. either with a down-to-earth report, a well-founded analysis, or an edgy opinion piece.